The in GCC contained formula solver helps you to solve complex calculations, easily on your outdoor cachung tour. You got different functions with this tool, wich you may solve every cache and calculation out there! "(c * a - b) - (a + b) * d"
The formula solver now replace all values in your formula and gives you the result. As in your example, the solver calculates: "(8 * 6 - 4) - (6 + 4) * 2" with the result "24". If you have to edit or even delete one of your formulas, you could do this over the context menu inside the formula list. Just hold your finger on the formula, you wish to edit or delete. 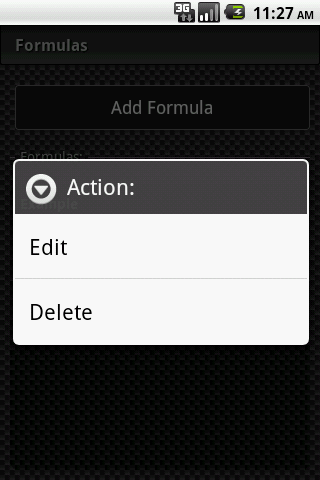 An dialog is now shown on the screen, wich allows you to edit or delete the formula directly. In the values area you could easily edit or change a single value as you want. But you even can reset all values at once. Just click on your menu button on the device an select "reset values". It is also possible to put your own text or the rest of the coordinates inside the formula fields. For this you have to put all your values letters and calculations inside of squared brackets, to replace them. As example: "N 52º 7. [a][(a + b) / d]'"
Now the contents of the squared brackets would be replaced with the result and shown in your text. So the output of the formula above would be: "N 52º 7.65'"
When you use the formula solver at your caching tour, would it in certain circumstances a bit annoying, that you have to open GCC first, to get into the formula solver. Because of this, we have invented the Widgets for GCC. 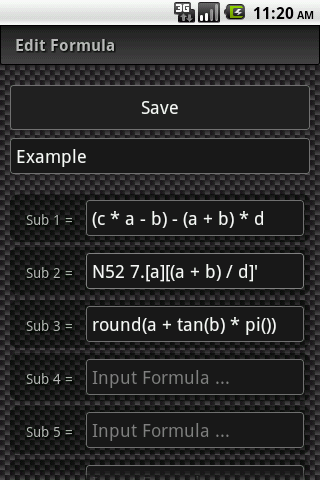 With this little helpers, you can put a link to the formula solver directly on the home screen of your android device. For this you have to search for an empty place on you screen an hold your finger there. In the opening dialog you have to select "widgets" and select "GCC Formula Solver". After this you have an direct link to easy and fast access the formula solver inside of GCC.